I recently wrote that Understanding by Design is agnostic about any specific method or pedagogy. The bottom-line question has to do with validity: given the goals, what follows? Thus, it makes little sense to say “I never lecture” or “I always do authentic assessments” as if it were a question of ideology or personal taste. As educators, we should use the methods that best work to achieve our goals. As the etymology of the word suggests, the original lectures were readings. The teacher (or priest) read hand-written speeches in the absence of printed material since the printing press had not yet been invented. The student’s job was to take verbatim notes as a way of both learning the material and capturing the ideas in print. To this day, many formal lectures involving the reading of papers. What could not be more obvious as efficient pedagogy? The expert knows things the novice doesn’t. So, the expert shares those insights orally. The nagging question, of course is: it may be efficient, but how effective is the lecture? And what, really, is the pedagogical purpose of any lecture? Any hope we have of analyzing and evaluating the pedagogy fairly depends upon looking closely at the “backward design” logic of goals and means. A deeper look at pedagogical purpose. Any pedagogical decision about methods is best made by looking at what goals imply (as opposed to what the teacher merely feels comfortable doing). In other words, if the lecture is a means, then toward what end(s)? And given any proposed rationale based on the logic, we would next consider: how effective is the method when contrasted with other methods? Students need to know core information. Yet, the textbook is too dense and daunting, and it does a poor job of showing the big ideas that connect the facts. So, my lectures are necessary to help students understand what is important and why. (And too often they don’t read or have trouble reading the textbook). My goal is for students to see the value of the content, not just know the content. My role as a lecturer is to make students who are naturally disinclined to care about the content to see it as intriguing and important, and only a lecture designed to do so can achieve this effect. Modeling thought processes. The benefit of hearing an expert learner lecture on a subject is that, if the lecture is clearly given, the audience can gain some insights into what makes the expert an expert. A good lecture does more than convey facts or put problems on the board — it lays bare the cognitive processes that an expert uses to assimilate those facts or think his or her way through those problems. Sharing cognitive structures. Lectures provide the important opportunity for the lecturer to share the mental models and internal cognitive frameworks that worked for him/her when he/she was learning the content. For example, when I took Calculus as a high schooler, I learned the Quotient Rule using the little ditty “Ho D Hi minus Hi D Ho over Ho Ho” and I still cannot perform the Quotient Rule by hand without singing that to myself. I share that whenever I teach Calculus and it works with students — and it’s not something they would necessarily have come up with on their own. Giving context. Good lecturers know more than just their subject material. They know the context in which that content sits and how the material relates to other things — things that a novice learner might not think about, just because he or she is a novice. Lectures are good places to learn some things from people with a broader set of experiences than you have. Telling stories. Stories from popular history or culture or from the professor’s own life are a kind of cognitive structure that help students to relate to the course and see the course content in a different way. For example, students learning logic have trouble with the notion that a conditional (“if-then”) statement is actually considered true if the hypothesis (the “if” part) is false. So I tell a story about promising my kids ice cream if they finish their dinner. If they didn’t finish their dinner but I got them ice cream anyway, it doesn’t make me a liar — so my “conditional statement” was still true. This connects somehow where truth tables don’t. On the other hand, when Bligh wrote there was no Internet. Even teachers who embrace lecturing and regard it as an important pedagogy have to admit that times have changed technologically. Since the lecture was invented in the era before the existence of the printing press – never mind the Internet – what is the role of the lecture in the modern era? Does it have great value? Or does it hang on by habit? Backward Design. So, we need to use the logic of backward design to critically explore the issue of the appropriateness of lecturing. The logical question is: What is the best use of time in class and out of class, given our goals and given the availability of modern educational resources beyond the words of the lecturer? 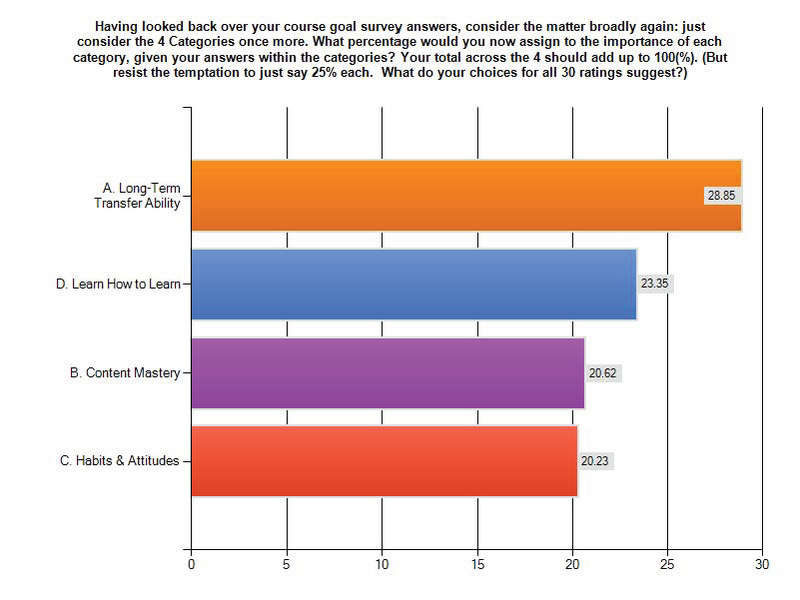 What are our learning goals, and what are the different types of goals? In other words, what kinds of achievement do we seek in our courses? IF… THEN. Given our goals, what logically follows for teacher methods and student activity, in and out of class? What is the best use of limited class time, in a world of easily-accessible information? If pure lecturing for lengthy uninterrupted periods of time does not seem logically appropriate, given the previous answers, when, for how long, and on what should teachers lecture? Might we say, then, that as a rule of thumb, the results suggest that a teacher should not lecture more than 25% of the time in any course with complex learning goals of the type mentioned? The lecturer is prone to self-deception in judging the value and efficacy of the lecture. The habit of lecturing runs so deep in secondary (and college) education that the lecturer may not be aware of rationalizing this habit at all costs when they argue for the benefits of lectures. The lecturer is prone to egocentrism and confirmation bias about the value of lectures. We all recall great lectures; we easily forget how rare they were. And we think that our own education is the model to advance – even if modern educational research casts doubt on many of the practices we encountered as students. “If it worked for me, it will work for them!” This is especially egocentric if most lectures we encountered were in college and yet we now teach much younger students. Why is the lecturer prone to self-deception? The structure invites it: the longer I speak, the less I know how my words are being taken and processed by the learner. And the clearer I am in my own mind about what I am saying and why, the more I may be blind to how unclear, confusing, or unhelpful the lecture is to a novice. Put bluntly, the only question that matters is: was the lecture effective at causing the goals identified? And without ongoing feedback, the lecturer is the last person we would ask for a definitive answer. Notice also that I do not count whether a lecture is inspiring or not. No doubt many lectures are inspiring, but being inspired and being taught are not the same thing, and just having one’s thoughts provoked doesn’t mean that one has interacted with the lecturer in any real way. I am inspired by many of the TED talks and sermons I hear, but it doesn’t mean I have learned anything. I had a pastor once who was unfailingly inspirational — and I couldn’t remember a single bit of what he preached on, nor could I give even a coherent outline of the sermon, within two hours of church being over. It is the most undifferentiated and unresponsive approach to teaching that is possible. The lecture is premised on the idea that each and every student will (or should) profit from one message, spoken one way, at one pace, using one method. It assumes that understanding occurs through mere listening and reflecting quietly rather than through questioning, discussing and trying to use the learning. (i.e. it reflects its ancient heritage of a pre-modern world where learning was purely intellectual and meditative). Athletics, the arts, and professional training in business, law, medicine and engineering provide important and more modern educational counter-examples. If the goal is to help learners make meaning of and transfer content in the future, then they have to be coached in how to do so. Coaches lecture, of course. But for far briefer periods and not for most of the course. Indeed, watching good coaches coach is to see new ways of considering our essential question: what’s the best use of class time? When should we lecture, for how long, and on what subjects – if our goal is deft performance with knowledge and understanding? Excessive lecturing is boring and off-putting to HS students. This is from the HS Study of Student Engagement: “Over four years of HSSSE survey administrations, student responses have been very consistent regarding boredom. In a pool of 275,925 students who responded to this question from 2006 to 2009, 65% reported being bored at least every day in class in high school… Thirty-four percent of students said that a primary source of their boredom was ‘No interaction with teacher.’” Our own survey data also confirms these percentages. And in constructed response questions, students in our survey report that their most disliked teaching technique by far is teacher lecturing verbatim from Powerpoints. Over 12% of 6000 + middle and high school students identified this as the least effective form of instruction. In the follow-up post, I will describe the most important and thought-provoking experiments with lecturing in the last 100 years that suggest different answers to the key question of What’s the best use of class time? 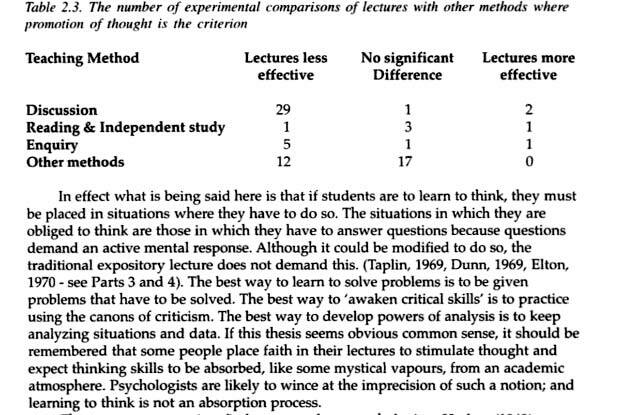 such as the One-Minute Essay and the use of LRS devices (“clickers”) which by design address some of the key weaknesses of lectures noted above. Eric Mazur’s Peer Instruction embodies most of these new approaches, as does, of course, the recent trend of “flipping” the classroom. I will also share the results of an email a correspondence with John Hattie on the subject. Nothing is as satistifying as delivering a well thought out lecture. I can wax eloquently with the perception that the students have a dreamy look in their eyes that can only mean they are intently absorbing my message. However, when I assess them on what I said, I’ve come to the realization that the dreamy look in their eyes was just that–dreaming–of being somewhere else during my lecture. One thing I have learned using CPM is that I have an extremely large ego. I used to believe that my students actually wanted to hear what I have to say about mathematics. I was wrong. You may well have connected more than you thought (having given many lectures myself perhaps I am engaged in hopeful projection) — but your candor is enlightening and refreshing. Teaching must ultimately about the Learning And The Learning. Thank you so much for this! What a brilliantly written post and blog with a lot of great ideas. You would do far better to admit your own ideological bias than mask it with “research,” Doctor. You present not a shred of scientific proof that lecture is inferior to other methods, but you do go to elaborate lengths to place your conclusions in the correct philosophical context. No more than 25% of a course should be spent on lecture? Sure, if one agrees with the sloppy stack of philosophical preferences from which that number is derived. I can respect a clergyman who stands for what he believes, and I can respect a scientist who stands behind his research. I cannot respect a clergyman who thinks he’s a scientist. As it is, there are enough Lilliputian administrators scurrying through classrooms, issuing demerits to any teacher with the nerve to stand at the front of the room and, you know, teach. What a pity that you feel the need to help perpetuate that sorry state of affairs. Shame on you. “not a shred of scientific proof”? What would a shred of scientific proof be? Proof is proof, right? Whether one has a shred of proof or the whole cloth, it would still be proof. But short of proof, there are varying degrees of evidence. One cannot earnestly say that there is not a shred of evidence for what Grant says here, since he, in fact, points to a mountain of evidence. Instead of dealing with that evidence–and to critique evidence or offer an alternative interpretation of it would certainly be different than ignoring it–some would rather raise the bar from evidence to proof. I imagine that those who do that would not be willing to apply the same standard both ways. What “shred of scientific proof” or even evidence is there supporting the practice of those who “stand at the front of the room and, you know, teach”? Please see a study called “Is Traditional Teaching Really All That Bad? A Within-Student Between-Subject Approach,” Guido Schwerdt and Amelie C. Wuppermann, 2009. Having said that, there is research, and then there is evidence-gathering. I, too, can gather a “mountain of evidence” for my views, but that would be meaningless because the whole student-centered versus teacher-centered debate remains a matter of philosophical preference. It’s a non-falsifiable claim to say that one is better for students than the other, meaning that both views are beyond the reach of science to prove or disprove with certainty. My objection to Dr. Grant’s post is that it suggests objectivity when, in fact, Dr. Grant has only gathered evidence for his opinion that lecture should amount to just 25% percent of a course. If you want to be an ideologue, be an ideologue. If you want to be an empiricist, be an empiricist. But please don’t masquerade as one while clinging to the methods of the other. Grant specifically calls 25% a “rule of thumb,” a way of putting a rough number on a larger objection to too much lecturing. If no one’s defending 25% as a hard number, then it’s hard to call it ideological. (Likewise, who’s talking about “student-centered” teaching here?) It’s the larger principle about too much lecturing that’s in question. But I do not see how that is an ideological point either, since the effects of lecturing with respect to various types of learning have been measured empirically and since Grant points to that empirical evidence. How can a principle supported by the available empirical evidence be ideological, unless you’re using that term idiosyncratically? On the other hand, if there is significant empirical evidence in support of lecturing, I’m open to seeing it. Schwerdt and Wuppermann find lecturing to fare “at least not worse” than “problem-solving” at accomplishing a narrowly defined purpose in a narrow context. Importantly, they did not compare teachers who only lectured with teachers who only used problem-solving. All did both; some simply lectured more than the others, an average of 10% more in terms of time spent lecturing. Furthermore, they specifically state that their results “do not call for more lecture style teaching in general.” That hardly overturns the conclusions of Bligh’s review of research on lecturing that Grant cites. 25% is a very precise number. If we weren’t careful, we might be led to think it was derived from some immutable law of learning, much like Newton’s laws of motion. But no such laws of learning exist, and I fail to see in what universe a “rule of thumb” is anything but a preference and therefore ideological. It is this deliberate presenting of opinion as fact to which I object. Not to subscribe to any ad hominem stuff — but may I ask why the vituperative tone in your position? Lordy, was I vituperative? Perhaps it’s a knee-jerk hostility arising from fifteen years of being force-fed ideology in the name of research at numerous faculty in-service trainings. I don’t pretend to be either dispassionate or clinical, and I consider that a virtue. I wish that more experts who attempt to influence what I do would own up to their own ideological bias. Then, maybe, we can speak dispassionately. Dr. Wiggins, not Dr. Grant. Sincere, red-faced apologies. I like the reminder about when lectures may be useful and asking ourselves why we use them so much. I know we all need to constantly be looking at why we are using a particular teaching method. I think I just need to put a sign up next to my desk that asks, “Why am I doing this?”. That would come in very handy. I also think we as teachers need to think like students a lot more. We need to be asking ourselves how we’d like to be taught if we were the student. Let’s be honest, it’s way to easy let our egos get in the way. However, is the goal our ego or the students learning? I think we constantly need to be looking at the goal(s) and making decisions based on whether or not that teaching method gets us there. Kinda like driving a car I guess. You have to constantly make decisions that get you to your destination. My thirty-five years of experience as a teacher — and administrator — at/with grade levels K through college is that “lecturing” is such a default “methodology” for 95% of educators that we struggle to think in other terms. Even field trips, backward design, collaborative learning, etc — it’s all, well, still “lecturing” if the teacher remains driving the vehicle. And thinking like a student is, ironically, as hard for teachers as it is for husbands to think like wives, or parents like their kids, and vice versa. Lecturing can be brilliant, hard to do well, and require hours of prep – or it can be a snap, repetitious, and numbing for students. But the point is: it is as commonplace in the classroom as desks, rows, textbooks, and now, computers — all of which have zero to do with authentic learning, unless the teacher is genuinely oriented to throw him/herself fully into how the learner learns – and then reorient all methods of teaching. Spend just ninety minutes walking down about hallway in any school and time the number of minutes in that hour-and-a-half you hear “teacher-talk.” My guess: roughly eighty minutes. In other words — lecturing isn’t the point — learning is the point. And much as I love education…we’re not even ten percent of the way there yet. Great post, I especially liked the observation that “It is the most undifferentiated and unresponsive approach to teaching that is possible.” I still like me a good lecture from time to time though! For me the marks of a great lecture are the connections beyond the obvious, and the provoking of further and deeper thought. In a HS setting gathering multiple classes together (the entirety of the student body taking Biology) for a lecture, followed by small group seminar (the existing Biology classes) can be an effective instructional 1-2 punch. While not easily quantified, the Inspirational effect should not be entirely discounted. There is something to be said for bringing large amounts of people together to listen to an expert, else we’d not all as adult learners attend keynotes at conferences. True many of us don’t retain the facts and the specifics, but when you leave inspired to dig deeper (and when the educational institution provides the structures for going deeper) or “do something” then real learning can arise that might not be attained by watching a TED talk alone on your coach for homework. Giving lectures to larger groups than normal is an important idea, one that I am going to describe in the follow-up. You can lecture to ALL bio students and free up the other teachers to coach or lead seminars; and you can decide as a group on who might be best lecturing on which topics. Very nice post, I’m looking forward to Part 2. Very interesting post. When our school began working toward providing more question, problem, and project-based learning for students, many teachers mistakenly assumed this meant they could no longer lecture or even provide direct instruction to students. I find this “throw the baby out with the bath water”-type thinking to be particularly prevalent w/ educators. I’m wondering if you see this in your interactions? It’s an endless problem. Dewey noted it 80 years ago: educators seem print to either-or thinking. Lectures bad; projects good! projects bad; back to lecturing! The only antidote is to have a process of IF/THEN thinking from goals, as we preach in Backward Design. Unless we are very clear on goals and what they imply, decisions become knee-jerk and without qualifications. The research is very clear: no direct instruction = limited learning. (See Hattie). The problem on the other side is that people read – oh, direct instruction is good. So, we’ll lecture…. No, that’s not what Direct Instruction is nor what common sense suggests about helping kids get the coaching they need. 2. So long as our colleges and universities–particularly at the freshman/sophomore level–continue to rely on lecture as a means of delivering information to large group of students in a short amount of time, couldn’t the case be made for lecturing as a means of teaching students HOW to learn from lecture? Especially in content overloaded courses like the sciences? This obviously has to involve intentional instruction on note-taking, summarizing, previewing and reviewing materials, etc. Or maybe I’m just being self-deceptive and desperately looking for justification. Thanks again for the challenging post, and for forwarding a really important discussion. I will eagerly await the follow-up. Your second point is of course of importance to every HS teacher who uses this as a rationale. I would say: along as you actually teach kids how to listen, how to take notes, and how to ask questions after a lecture, then that would have benefits. Alas, I think many HS teachers merely mimic the format and think that, somehow, this is ‘preparing’ kids for college lectures. That is surely self-deceptive. My point moving forward will be fairly common-sencsical: lecture for shorter periods, and lecture in response to need, much like what teachers in the arts and athletics do. And get lots of feedback from learners as to what works, what doesn’t, and what they need more understanding of. Another point: much of what HS teachers would probably characterize as “lecture” is really no such thing. Real lectures are PLANNED (not improvised) and do not consist of displaying and effectively reading bulleted PowerPoint slides that students are supposed to copy. I particularly appreciate what you’ve written here about self-deception. I imagine that that applies to a lot of things when it comes to teaching and to learning. I recall one colleague’s unjustified certainty about the efficacy of the exams he wrote. And I recall more than one student’s unjustified certainty about the efficacy of their non-revising writing process. One added opportunity for self-deception when it comes to lecturing is when lectures without realizing it. I’ve seen more than one teacher have a “discussion” with students but actually do all of the talking. I was about to say that Enlightenment science was born out of a dawning awareness of people’s tendency to self-deceive. But older religious traditions were already keenly aware of the same phenomenon. “The” great epistemological challenge is that we don’t know what we don’t know, including, often, that we don’t know. One of the enduring aspects of the human condition is that rather than put up with uncertainty or entertain the possibility of being wrong, we convince ourselves that we do know. Can anyone point out any studies on teacher’s self-deception? This is beautifully and logically laid out. It is also a powerful challenge to the traditional lecture format – and to educators from K-16 who still argue for the transfer of information from their brain to their students’ brains, a transfer that is woefully inadequate and painfully wasteful in many cases. Thank you yet again for clarifying how important it is to put the learner in the driver’s seat – and reminding the teacher/lecturer that s/he must keep asking: Who needs to be learning here…. Thanks! I hope the doubters will ponder and use some of the practical tips for experimenting via the next post. It REALLY is the revolution to look at things from the students’ perspective. Even the most ardent supporters of C Core Standards don’t seem to grasp that Standards can only be met by students, not teachers, yet little attention is being given to how to provide incentives, opportunities, and feedback to learners in local reform work. The student is in the presence of an amazing mind that is exposed and revealed during a brilliant lecture. It is a privilege to learn from some in this manner. Grant, I just wanted to say thanks for the lengthy quotations from my blog in this article. I appreciate it, and I enjoyed the article. Looking forward to the next article as I’m very interested in peer instruction and have tried to use it quite a lot. You’re welcome! Thank you for a great post. I hope that at the very least a civil discussion of the strengths and weaknesses of various approaches to learning will ensue, and your original article is part of that discourse. A great staff discussion piece! I enjoyed this, along w article from Harvard. I am coming to understand a traditional lecture as providing an answer to a question that hasn’t been asked. I use that as a guide for when to lecture in my classroom. When a large portion of the class is asking me the same question, or a group of related questions, that’s when I lecture. And I keep it brief, on-topic and interactive. That’s been working for me. I agree. That is part of the secret of Mazur’s Peer Instruction in which as the course evolves the students request lectures. I’ll speak to that in the next post. Grant, I think of you as the ultimate functionalist. Thank you. I can’t tell if that is high praise or not 🙂 What do you mean by ‘functionalist’ here?